Businessman Is Giving A Task To His Female Secretary In The Office. You can see young man (freelancer, businessman, programmer, graphic designer) working in his studio flat, living room or agency office. 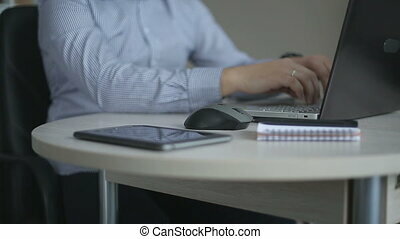 He has a perfect workplace: wooden table desk, notebook, reader, pen, copybook. He has hard work. He is typing with the keyboard and clicking mouse. This is a perfect footage to illustrate themes remote work, day in home office, intensive working week, perfect employee. Also it is good with topics like new ideas, young professional or studying hard. Human resource. 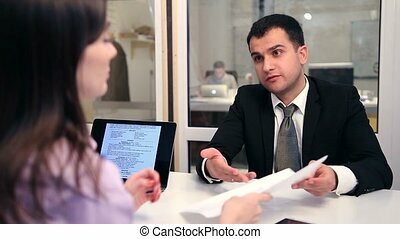 Smiling candidate handling his recommendations to female recruiter during job interview. Young businesswoman interviewing job applicant at the table in office. Male boss giving instructions to his female secretary in luxury jet. 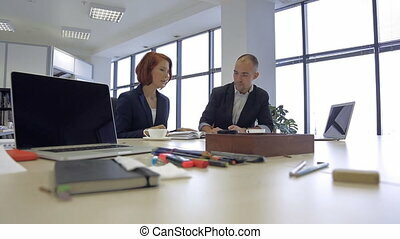 Successful businessman in suit sitting in confortable chair and dictating the list of deals to do to woman with red hair, who is taking notes. Male boss is explaining the digital currency market tot his female secretary at the office. The colleagues are sitting at the big wooden table with red folder and notebook on. The businessman in suit is holding his smartphone and showing bitcoin exchange rate graphs on the screen to blond busimesswoman in blue shirt, who is taking notes. member of the press, journalist, talk with the person, which is interesting to readers in his office. editor of the magazine and the man of the representative species communicate, walk on foot to the table, are working together on a project of a new article, on the table lies blueprint of the house. Ring on his finger, business suits, bright, large spacious office, modern laptop, a huge table on which you can draw a pleasure. active creative work. maybe it is the main build coder, Secretary, designers. 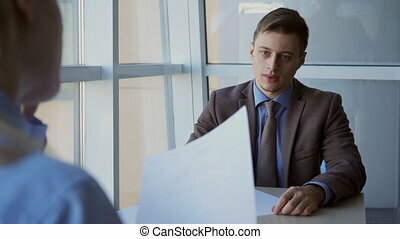 Young male businessman wrinkling the report of his female subordinate. The blond woman in light blue shirt gives a paper to her boss, he looks ant and negatively shaking his head. Colleagues are sitting at the big wooden table in front of the big window in modern comfortable office. Beautiful hispanic woman in a nice office with his hipster male financial consultant expert at the meeting, the two sit at the large wooden table on the table a few charts, annual reports, and the state of the money in her account, deposit, electronic purses, represented shares and falling demand. Nearby is a tablet, a laptop and a lamp. She wore a loose modern, feminine shirt. discuss the solution of the active financial flows. 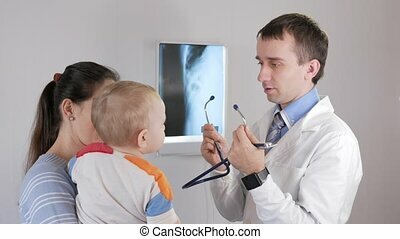 The male professor checks the solution of the problem during the privat consultation in his office. The blond female student in blue shirt wrote the task decision on her notebook and the man in looks through it with a pensil. The academic people sit at the big wooden table in comfortable chairs and the whiteboard is behind. 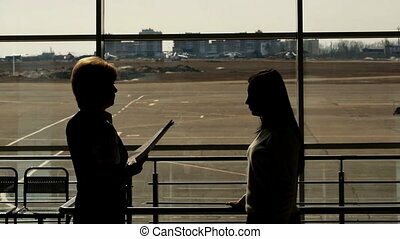 Silhouette of strict woman at the airport gives instructions to the young officer. In the background, helicopter, helipad and homes. Chef with a paper in his hand he tells and shows a subordinate task. Head to the red short hair waving his arms, instructs and points out the place. Young worker listens and agrees. The street layout is clear for planes, handrails and railings. Beautiful hispanic woman in the office with his hipster male expert financial adviser during the meeting. Nearby is a tablet, a laptop and a lamp. She wore a loose modern, feminine shirt. discuss the solution of the active financial flows. Female sit at the large wooden table on the table a few charts, annual reports, and the state of the money in her account, deposit, electronic purses, represented shares and falling demand. Beautiful nice tax consultant and financial annual statements woman modern office makes recommendations to his male client companies, experts at the meeting, sitting at a large wooden table, an expert raises topical issues, few analytical charts, capital, annual reports, and the state of the money in his account , deposit, electronic purses, represented shares and falling demand. She is wearing a black jacket with a modern dress underneath, hand and neck, lots of jewelry and jewelry.